“Imagine London without its magnificent trees and the stark brutality of the remaining landscape if they were to disappear due to lack of professional care and the threat posed by pests and diseases” was the clarion call from the Arboricultural Association to the All-Party Parliamentary Gardening and Horticulture Group (APPGHG) in Victoria Tower Gardens on Tuesday 18 July 2017 from 9.30am to 11.00am. Following last year’s well received presentation on quantifying the value of trees and the importance of tree establishment, a number of members of the group and other MPs were on hand. They included the ‘Shadow Minister for the Environment, Food and Rural Affairs’ Dr David Drew MP for Stroud and Rebecca Pow, MP for Taunton Deane and current Chairman of the Conservative Backbench Policy Committee on Environment, Food and Rural Affairs. Before the presentations began Lord Framlingham, President of the Arboricultural Association from 1989 –1995, was awarded with a lifetime honorary Fellowship by Chairman Keith Sacre. As an MP from 1983 until being raised to peerage in 2011, he has long been calling for an enlightened policy on trees during debates. Having gratefully receiving this recognition the former arboricultural consultant then turned to address his parliamentary colleagues, speaking with real emotion on why arboriculture is undervalued and needs their support. 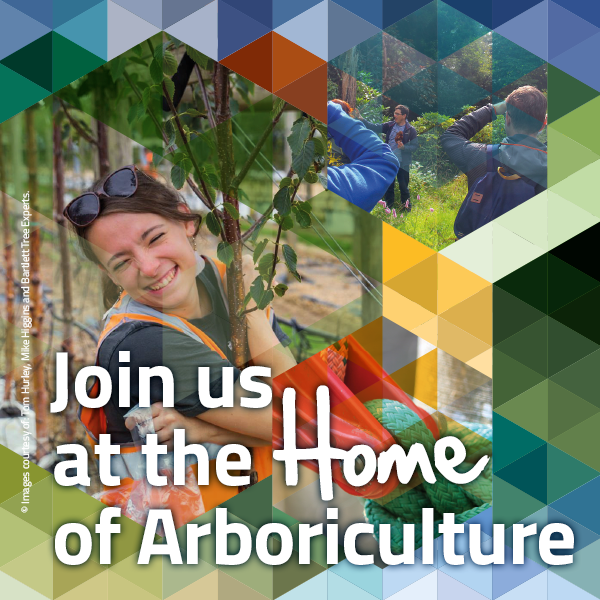 Jo Hedger and John Trenchard from ARB Approved Contractors ‘Arbor-Venture Tree Care’ kicked things off with a live demonstration, including a practical job site role play, which highlighted the technical complexities and skill involved in professional arboricultural practice. While the 3-time world tree climbing champion ascended one of the embankment Plane trees John explained the high risk nature of the job, site set up, equipment and climbing systems. Jo then demonstrated a few different techniques with some light pruning, which drew in a throng of public spectators. Baroness Fookes was so in awe at the display of expertise that she asked to have a go at holding Jo’s lightweight electric chainsaw. Keith Sacre outlined how the many benefits urban trees bring are now under threat, presenting the group’s members with stark images of how London’s’ famous embankment and parliament square vistas would appear should their resident Plane tree population succumb to Plane Wilt or Massaria. Keith called for parliamentarians and their colleagues to change their short termism approach to trees and “plan for their life spans, not ours”. Pests and diseases expert James Roberts of Forestry Commission England followed on from Keith by giving an excellent summary of the species currently under threat, their symptoms and their current impact. He also briefed on the most prominent threats on the horizon, noting the risk from imported pests and disease as a key issue. Delivering the keynote presentation to the distinguished audience John Parker, Chairman of The London Tree Officers Association, spoke passionately on how Tree officers and the urban forest are suffering after years of austerity to detriment of public. In a memorable closing address John, using the results from the Associations recently completed a survey of UK tree officers among his evidence, stated that we must gather more data on our urban trees and that support is urgently needed from Government so we don't lose the specialisms of these custodians. With each London tree officer managing 5,000 trees, John asked which other public sector manager was responsible for assets of such value. Approximately 40% of our trees are managed by the public sector, and tree officers are under severe pressure. Following a successful event, we’ll be continuing to lobby government and promote our industry to the wider public. At the annual meeting, the Association put forward 3 key asks to George Eustice, Minister of State at the Department for Environment, Food and Rural Affairs to put professional tree work and trees higher on the agenda.